Glogirly was gone for a while today. Gave me the old "bye-bye kitty, love you, be right back" routine. Yeah whatever. Here, let me get comfortable while I wait for you to return to this lonely, empty townhouse I'm supposed to call home. A few hours later though, when I awoke from my slumber, I discovered something wonderful. Something so magnificent I had to pinch myself. Glogirly went to one of my favorite stores and SHE CAME BACK WITH A BAG! The bag is pretty cool alright, but I'm more interested in what's inside this time. 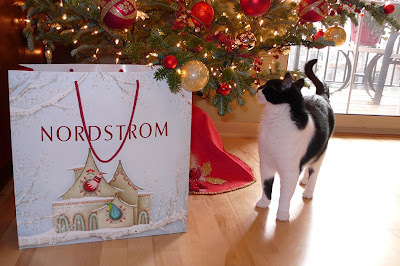 Don't worry, I know for a fact that Nordstrom does not sell cat apparel. Phew...had you scared there for a moment, didn't I? And what I'm hoping for won't be found on the shelves of Petsmart. So girls, what is it we all know Nordstrom is famous for? That's right! Ok I hope you're sitting down now. You might need a glass of water, maybe a fan. Take a deep breath. So Glogirly pulls this white box out of the bag and I catch a glimpse of the name on the box. I had to rub my eyes to make sure I wasn't seeing things. Before I knew it she opened it up and pulled out my very own pair of Jimmy Choo's! Neither Glogirly nor I have ever had our own pair of Jimmy's before so this was quite a moment. Aaaah, those skinny high heels make me tingly all over. And they're so shiny I can almost see my gorgeous reflection in them. I am SO going to have fun with these alright. Finally I can kiss those stupid Merrel's and Clark's goodbye. Yeah, they're dependable. Always there. Safe. Comfortable, blah, blah. But I want to run with the big girls now. I want to twist and twirl with reckless abandon. I want to frolic through fields with these strappy little numbers. Well, I really don't have access to a field, so the upstairs carpeting will have to do. Truth be told, Glogirly has been planning the perfect outfit for an upcoming Christmas party. Naturally I had concerns at first, but I found out the party isn't here so I don't need to worry about a bunch of smelly strangers traipsing through the townhouse. The other bonus to all of this is that there's no way Glogirly is going to be wearing these new little treasures everyday. I just can't see them at the gym or the grocery store. No way at the bus stop. So with the exception of few special occasions, these wonderful little pieces of shiny, strappy goodness are mine. All mine. Some kids dream of finding choo choo's underneath the tree on Christmas morning. I suppose even some cats too. But for me Christmas came early today and it came in a beautiful white shoe box. I know you fellow shoe whores can relate. How nice of Glorgirly to get you such nice shoes for your very own. Enjoy! Our Angel brother Abner had a shoe fetish. He just loved to have visitors cuz he'd do his best to either steal their shoes or dump the contents of their purses all over the floor. Our Mom speaks: WOW! :Drool: I just LOVE them! We speak: :sheesh: Wot is it wiv girls and shoes? Our Mom speaks: Theses aren't JUST shoes! They are Choos! You gotta be a girl to understand! They really look great with you. So elegant. So different from what we have here. We play 'boat' with photoguy's big shoes. But, eh, if you are not doing anything with it, can we have the box? Such pretty shoes! We hope you enjoy them very much. We live out here in the woods so the idea of anything so strappy and high causes us extreme stress. Especially this time of the year. I think Glogirly would have been wise to invest in a nice pair of snowshoes. The PM though is in a catatonic state over here for some reason. Glogirly, your shoes are stunning and we hope you enjoy wearing them. I am afraid my mum hasn't worn heels like that since I have known her, she seems to like the merrells and the keen shoes better. I am sure your girl will feel very glam on the night, she needs to show us her outfit now. wow I'm completely envious here, what a FABULOUS shoes!!! My mommy had the same feeling, we are fascinated by those beautiful shoes! Also, I loved your Christmas tree, it's adorable just like you are! Our Mom is drooling on the keyboard. Can you get Glogirly to take a picture of the side of the shoe so Mom can torture herself even more? Wait till Huffle's Mom sees this!! The shoes are beautiful. Yes, let's see the whole outfit for the party now. katie, you are very astute to realize the shoes will be spending more time at home with ou than out and about, since they are special party shoes. We don't know what all the fuss is about a pair of shoes, but our mum says,'Wow! they are gorgeous'. We do think your new box is very elegant though. We have to try and stop our mum gazing longingly at them now. I can see Glogirl had you in mind when she picked those heels. 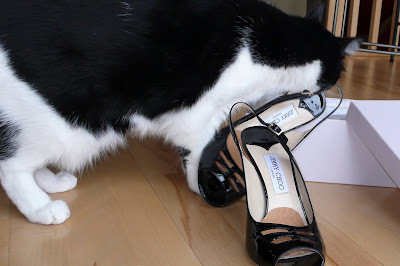 I myself am not a shoe girl, but my sisfur Boo is. WOW is she. She falls all over Mom's shoes. She doesn't care if they're athletic shoes, boots, or sandals, they are all wonderful. Yesterday she swooned over Mom's boots, and she especially likes being in Mom's closet. She also likes leather belts. She can spend hours in Mom's closet...I just don't get it. So, are these 'do not chew' choos ? Gorgeous Katie! I am very jealous! I am drooling all over my laptop now! I hope you enjoy your very own Jimmy Choo's! 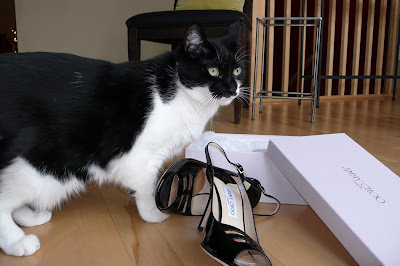 It is not lost on my that those Jimmy Choo's match my fur purfectly. I'm going to dream of grabbing them by their strappy little heel straps and dragging them through the house....singing at the top of my sweet little lungs. Cute shoes! They would like great on you Katie! Please, Please take a picture of Glogirly in her outfit, ok Katie? 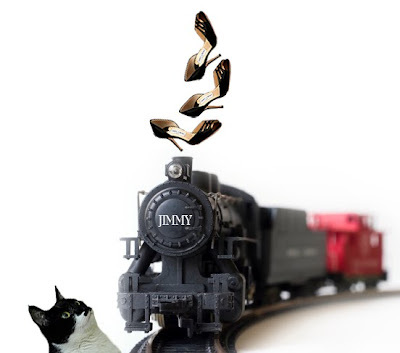 Around here, if those Choo's were left out, Scooby would be chomping on the skinny straps in no time. My mama and sister are gawking at the picture. They also want to see the "perfect outfit". I just don't get women and shoes. Katie: you get some good lookin' shoes and we get tennyshoes. PS. Do enjoy your shoes. 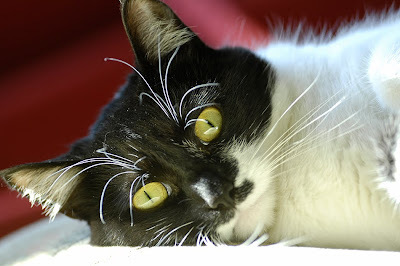 I need to hiss at Tommy--after I chew on the tennyshoe string. Kewl Choos! We like the boxes the best and the tissue paper and chewing on the little cardboardy things. Brighton has perforated all of mewmies Crocs she wears at work (purrsonalized!) and she would be made if she had some chews on her Choos, HaHaMeow. She mostly wears Merrells, too and they are pretty chew-proof! Those shoes are something else! They are beautiful, I hope you will share what outfit these are going to be worn with!! Is it a Christmas holiday party or New Year's party? It may surprise you to know that I, a DOG, like shoes. They're ever so handy to hide Nylar bones in, not sure these strappy kind would work too well! Wow, that bag is way cool, but you're right, it must be a girl thing, Sister Zoe love to lay on shoes here. Me, I like the boxes they come in, does that count??? Are you sure GG can be trusted to wear YOUR shoes out? What if she spills something on them? These are YOUR shoes Katie! Stand firm. I guess the shoes are cool, but we were definitely more excited when you mentioned "the bag" and "the box". Maybe because Mom never buys exciting shoes. Katie, my mum says that GloGirly is a girl after her own heart. Mum owns Jimmy Choos and Pradas and Christian Louboutins and, oh the list goes on and on. She's a definite shoe whore. She takes photos of her shoes and sticks them on the boxes. It's like she's autistic or something. We have just been over at our friends Adan and Lego's blog, and they have the perfect Christmas tree for you. We're all boys over here so we aren't moved by the "Choos". But mom thinks they're awesome & wants a pair of her own! Very nice shoes! Nanny is not big on shoes, she like the ugly ones like running shoes. GloGirly is very pretty and I bet she shine in those choos! very cute pair of shoes! Love this post! Great pics too! Whoo hoo those are beautiful! Katie, you look so good with black, shiny, shoes. I bet the humans should think about making you a model for human products. I suppose you could wear sunglasses and be glamorous more than ever. Red is also you perfect accent color. Thanks for sharing about your new shoes. By the way, my Yellow Kitty would crawl into that sack if it were laying on it's side. Take care.